I have decided to do a small guide so that if any of you have the same problem as me, you can fix it yourselves without forking out £40 - £100 getting it repaired. 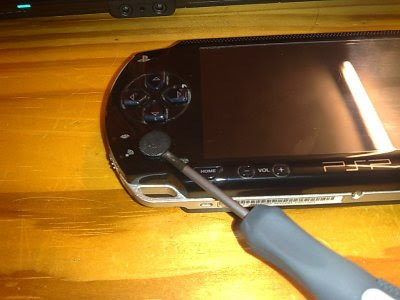 Be warned though that it does involve opening up the PSP, so if yours is still under warranty, I'd advise not doing this. Firstly, the most important thing to do is find somewhere nice to work - somewhere that is'nt cluttered. 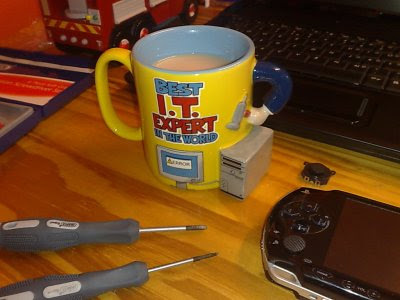 Oh, and make yourself a cup of tea too. Next, get your replacement joystick module handy, and a very small cross head (Phillips) screwdriver. You may need a small flat head screwdriver, depending on whether you have good finger nails or not. 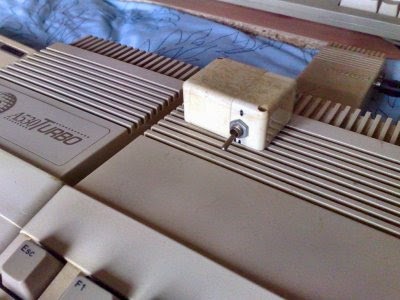 Pull off the joystick cap. If you have long nails, you could probably use your fingers. If not, use a small screwdriver. Just pry it off. Trust me, it comes off. 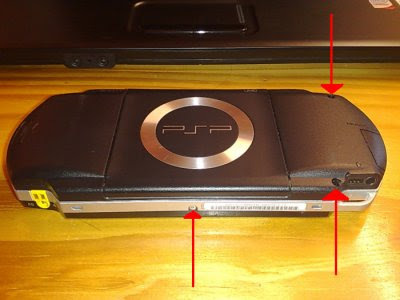 Turn the PSP over (screen down) and locate the following three screws. Unscrew them with the cross head (Phillips) screwdriver. 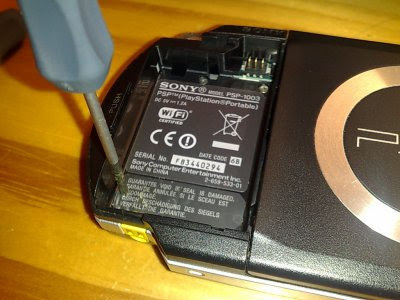 Remove the battery compartment cover and the battery and unscrew the screw as shown in this picture. The next screw that you need to remove is located under the 'guarantee void' sticker. 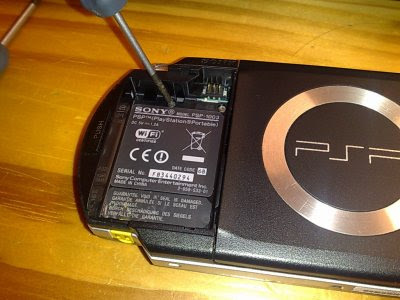 It is impossible to remove this screw without damaging the sticker, so unless your PSP is still under guarantee, unscrew the screw! 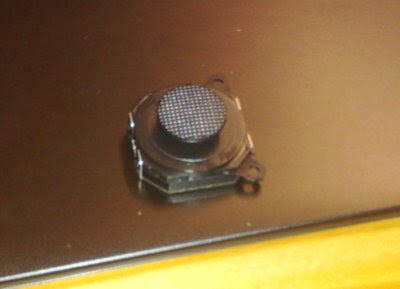 You will probably not be able to see the screw, but trust me, it is there (well it is with my PSP1000 model). Either unscrew it through the sticker, or remove the sticker completely. 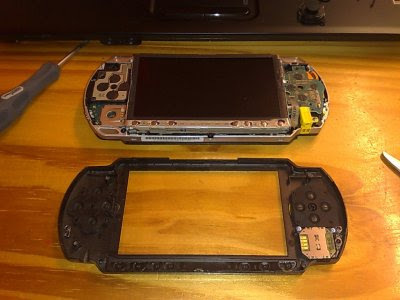 You can now remove the cover to the PSP. Try not to get your fingerprints over the screen. 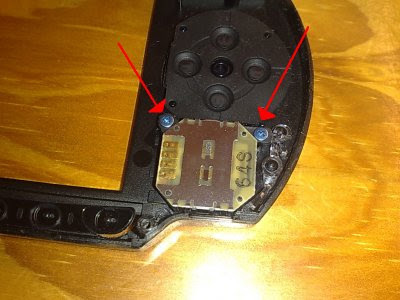 Locate the faulty joystick module, and unscrew the two screws completely. Voila!!! 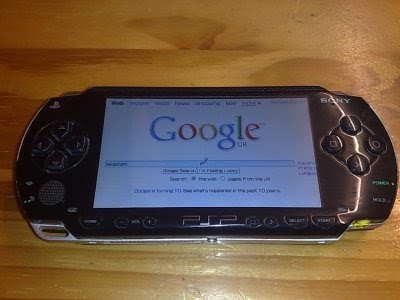 One perfectly working PSP, with a joystick that no longer moves on its own!!! This morning I've been rummaging through our loft, trying to make room for some of Kierans baby toys which he does not play with any more. I was pleasantly surprised when I came across a couple of boxes containing some of my old computers that I haven't used in years. I just had to get them out and have a go!!! 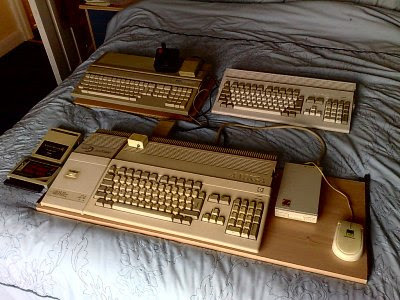 Amongst the collection was an un-upgraded Atari ST520FM, a Commodore Amiga 1200 (with a 1gb Harddrive), and my beloved Commodre Amiga 500 with its super 68040 accelerated processor (from 7Mhz to 40Mhz thanks to the A530 upgrade), 120Mb harddrive, toggle switch for changing between Kickstart 1.3 and 2.0, external floppy disk drive, Action Replay Mark III cartridge and a VideoMaster digitiser!!! WOW! Fortunatly years of neglect did not mean that these machines would not work, and within minutes of setting them up I was able to load up all sorts of stuff stored on the harddrives. I found programs and songs that I had written years ago which I had forgotten about. It nearly brought a tear to my eye! 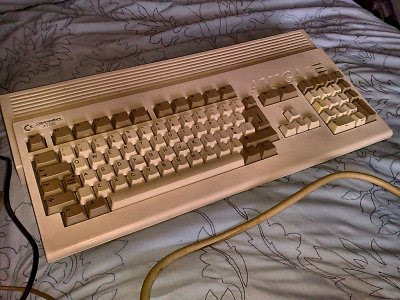 Although I emulate the Amiga on my PC to play all of my old favourite games, nothing beats playing the games on the original hardware - It's the same with my Commodore 64 and Plus 4... Games load instantly when emulated on a PC, but sometimes it is nice to type Load, press play on tape and wait several minutes for the game to load. 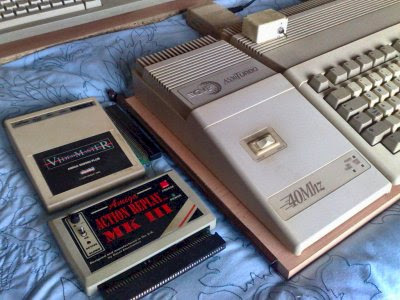 The A530 turbo with 120Mb harddrive and 40Mhz (68040) processor), Action Replay III cartridge and VideoMaster video and audio digitiser. 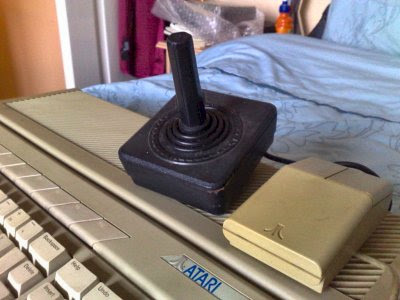 A retro icon.... An original Atari joystick - what a classic! What an incredibly hectic week it has been!! We managed to fix the network on Friday afternoon after discovering that it was down to a faulty fibre transceiver in one of our cabinets. As for the other problem, we have found a solution, but can't do anything until Monday morning. On top of that, you will not believe how many new Year 9 students came up to my office telling me that they could not log on! I mean, come on - I created the accounts in the holiday and set all of their passwords to their date of birth. All staff were told this, so is it really that hard for these kids to remember the date that they were born???? Anyway, changing the subject a little, I am pleased to announce that in my attempts in getting Michelle more tech-savvy, I have finally convinced her to start up her own blog. She has started a diet and after having an extremely successful first week (yep, she lost over 8lb in just one week), she wants to write all about it. This is the first time she has ever done anything like this, so if you do go and visit her blog, be easy on her! Right, I'm off now to relax on this rather grey Saturday afternoon and listen to some more movie soundtracks - Currently listening to 'Raise The Titanic'. Not a great film, but certainly one of John Barry's best soundtracks in my honest opinion. T T F N - Ta Ta For Now! 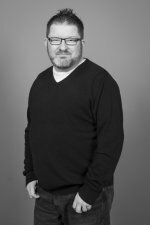 ...Of course, I was hoping for an uneventful day, but by hometime I was already counting down the days until half-term. First I had to do a short Powerpoint presentation infront of all the staff in the large hall in the morning (I hate speaking infront of people), then we lost the school network in several of the school buildings which caused a minor panic. We've also made some very big changes to the way our school network works, meaning that each member of staffs laptop needed to be re-configured.